Based on the novel by Robert Bloch, Psycho is the story of a woman hiding out at a motel after stealing some money from her boss. There, she meets the motel’s disturbed owner while her sister tries to find out what happened the night the woman disappeared. Directed by Alfred Hitchcock with an adapted script by Joseph Stefano, the film is considered to be one of Hitchcock’s finest films of his celebrated career. Starring Anthony Perkins, Vera Miles, John Gavin, Martin Balsam, John McIntire, and Janet Leigh. Psycho is a chilling yet engaging film from Alfred Hitchcock. Marion Crane (Janet Leigh) wants to marry Sam Loomis (John Gavin) but he’s unable to due to debt and to pay for his ex-wife’s alimony. When Marion is suddenly given $40,000 in cash by a customer she works at to deposit at the local bank, she decides to steal it instead. Though she has to deal with a highway patrolman (Mort Mills) and trade her car for another, she stops at a motel run by a young man named Norman Bates (Anthony Perkins). Marion has dinner Norman who talks a lot about his mother as she asks him if he wants to leave her but he couldn’t. Later that night, Norman finds something shocking as he realize something has gone wrong. Meanwhile at Loomis’ hardware store, Marion’s sister Lila (Vera Miles) visits asking Sam about Marion’s whereabouts. Sam admits, he has no idea where she is as a private detective named Milton Arbogast (Martin Balsam) is also searching for her over the $40,000 she stole. Lila asks Arbogast to investigate where he searches for Marion where he stops at the Bates Motel where he talks to Norman. Arbogast becomes suspicious as he calls Lila about going further as he wants to meets Bates’ mother. When Lila doesn’t hear from Arbogast hours later, she asks a local sheriff in Al Chambers (John McIntire) who reveals some startling things about the Bates family. Sam and Lila try to figure out what is going on as they uncover a shocking secret. The film has two narratives that eventually collides together into a shocking climax that is eventually tied together by a psychiatrist (Simon Oakland) who explains everything. In the first half of the film, there’s this secretary for a real estates firm that wants to get money so she and her lover can live a great life despite his debut. Therefore, she steals the money and tries to evade people until meeting this strange yet seemingly innocent man. Then there’s the second half where the woman’s sister tries to find her sister with a private detective who becomes suspicious about this strange man and the mother that he always talking about. Joseph Stefano’s script is filled with a lot of intrigue and motives as characters such as Marion, Lila, and Sam all have motives in what they want to do throughout the film. Marion and Sam want to have better lives while Lila is concerned with finding Marion along with Sam. Then, there’s Norman Bates who is probably the most compelling character of the film. Here’s this young yet very sheltered young man who likes to do things calmly as he is someone clearly devoted to his mother. Yet, when he is also someone who doesn’t like confrontations as he stutters and becomes evasive. Still, he does do things to people that makes them re-think their motives or make them suspicious. Bates is truly a mystifying character that really drives the story for a large portion of the second half as he becomes more provocative in the third as Stefano’s script is truly mesmerizing in its suspense and character study. Alfred Hitchcock’s direction is truly one of his finest in the way he opens the film with its wipe-driven opening credits to the first shots of the film overlooking Phoenix with mentions of what time it is and what day it is. Hitchcock’s camera is always engaged into what is going with the conversations and things as he always points his camera at something. The framing is very transfixing in the way Hitchcock allows the film to be shown whether it’s a simple of shot of people driving or the way he has two or three people at a frame. Then comes the way he builds suspense as he knows what to do with timing and once something horrifying happens. He just goes for it in the way he lets the camera move and to create something that is truly terrifying in tone. The overall work that Hitchcock does in his direction is amazing as he creates what is definitely one of his key films of his career. Cinematographer John L. Russell does some excellent work with the film‘s black-and-white photography from the bright daytime scenes to create a much friendlier feel to the film. For many of the nighttime scenes, there is something much darker as the shading and eerie camera work presents a tone that is truly chilling. Editor George Tomasini does amazing work with the editing in creating stylish, rhythmic cuts to keep the film moving along with some wonderful transitions in the use of dissolves and fade-outs to keep the momentum going. Art directors Robert Clatworthy and Joseph Hurley, along with set decorator George Milo, do some fantastic work with the art direction from the look of the Bates motel parlor to the interior of the Bates home as it‘s filled with an array of objects including stuffed birds. Costume designer Rita Riggs does very good work with the costumes from the dresses the women wear to the suits the mean along with the casual clothes that Bates wear throughout the film.. Sound recorders William Russell, Waldon O. Watson, and Harold Tucker do some superb work with the sound to capture the intimacy of the conversation and locations along with some amazing sound editing for the voice-overs that is prevalent in the film. The film’s score by Bernard Herrmann is definitely a major highlight of the film with its sweeping orchestral opening theme that is filled with striking arrangements and chilling strings. Herrmann also creates some amazing pieces such as the famed violin screeches for a harrowing moment on the film along with some low-key cuts. Herrmann’s score is truly one of his best work of his celebrated career as he adds a lot of suspense and flair to the film. The casting by Jere Henshaw is brilliant as it includes some notable performances from John Anderson as a used car salesman, Pat Hitchcock as Marion’s fellow secretary, Mort Mills as a highway patrolman, Frank Albertson as the client Marion steals from, Vaughn Taylor as Marion’s boss, Lurene Tuttle as Mrs. Chambers, Simon Oakland as the psychiatrist at the end of the film, and in the voices of Norman Bates’ mother, Virginia Gregg, Jeanette Nolan, and Paul Jasmin. John McIntire is excellent as the sheriff Al Chambers while Martin Balsam is great as detective Arbogast as they both bring some wit to their characters. John Gavin is very good as Sam Loomis, a man who loves Marion but has a hard time dealing with debt until she goes missing as Gavin maintains a low-key but a strong presence throughout the film. Vera Miles is superb as Lila, Marion’s sister who is trying to find her as she ponders about the strange things happening about her sister’s disappearance as Miles brings a real sense of desperation to her performance. 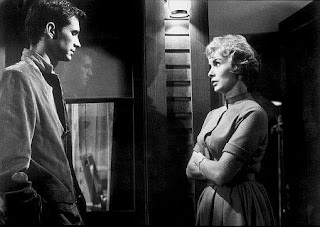 Janet Leigh is amazing as Marion Crane, a woman who steals money for a better life only to have an uncomfortable meeting with Norman Bates as it’s one of Leigh’s key performances. Finally, there’s Anthony Perkins in his iconic performance as Norman Bates. Perkins brings a charming yet boyish performance as the disturbed Bates that makes him seem harmless although whenever he stutters and evasive, there’s a complexity to that character as it’s something only Anthony Perkins could bring. Psycho is a smart yet hypnotic suspense film from the great Alfred Hitchcock that is a true standard bearer of what suspense films is and should be. Featuring a great cast led by Anthony Perkins, it’s a film that revels in style and intrigue over how it builds up its chills and its aftermath. This is a film that if anyone new to Hitchcock wants to see should find this as a great place to start. In the end, Psycho is a phenomenal film from one of cinema’s great masters in Alfred Hitchcock. Terrific review! You definitely nailed all the films aspects. I loved the direction, music, cinematography, acting and the story. Until I see Vertigo and The Birds, this is the best Hitchcock film I have seen and truly phenomenal in the sense of influence. Thank you. I need to see more Hitchcock but right now, I'm watching other films at the moment.